Stressed out for the holidays? Running around trying spread all that good cheer while not breaking the budget? Well, if you’ve got kids in school or care about education, you need to revise your schedule for this week. A critical meeting of the San Diego Unified School District Board of Education has been called for this week and your child’s school may be on the chopping block. 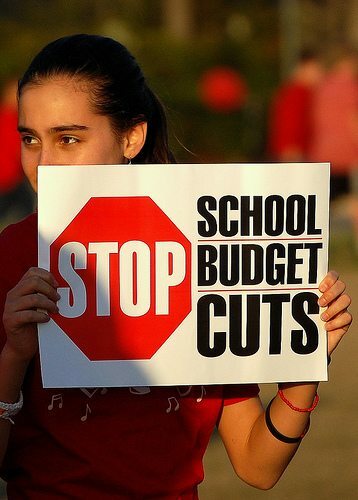 After parent groups around San Diego had sent out emails & made phone calls alerting parents to a Board of Education Meeting on Tuesday evening, they learned that the budget wasn’t really on that agenda. Another, hastily arraigned, meeting of the Board of Education has been announced for Wednesday, December 16 at 5 pm. The meeting will be held at the Board of Education complex (4100 Normal Street, in University Heights). If you’d like to testify before the Board, the sign up form is here. If you’d like to get a general idea of what the budget picture that they’ll be talking about is go here. You should also check out this parents group, VoiceforOurKids.org—be warned that there are some parents there that have (sadly) bought into the Union-Tribune’s attempts to blame all education problems of the teacher’s union. Since the sole focus of this Board of Education meeting will be budgetary discussions, it’s important for as many parents and concerned citizens as possible show up so we can pack the hall. See you there. I hope you guys are sending Doug to report on this. He seems to be the most uptodate on these school budget cuts. Molly, I believe Doug Porter is planning to attend. He’s also involved in the parent group mentioned. We’ll make sure we have him dogging the story. I’ll be there! I’m even passing up a foodie event to go. Maybe you can exchange your Carib shirt for something more appropriate.